Shoulder pain, stiffness or weakness can make it difficult to carry out everyday tasks, like reaching for something on a high shelf, driving a car or brushing your hair. If you have pain that won’t go away, it’s time to see a doctor. 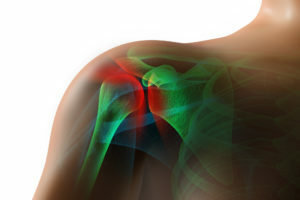 The rotator cuff is a group of four muscles and their tendons that surround the shoulder joint, and connect the shoulder blade to the upper arm bone. Bursae, small sacs near the joint, provide lubricating fluid that decreases friction among the bones, tendons and ligaments. Rotator cuff problems occur through overuse, and they include tendonitis, strains and partial and complete tears of the tendon. Tendonitis is when the rotator cuff tendon becomes inflamed and irritated; bursitis is when the bursae swell. Tendonitis and bursitis cause pain in the front and side of the shoulder, and you might also feel some stiffness. Treatment involves rest, applying ice, and taking nonsteroidal anti-inflammatory drugs (NSAIDs), such as ibuprofen, which is sold under the brand names Advil and Motrin, or naproxen, which is sold under the brand name Aleve. After a few weeks, most people with tendonitis recover, Dr. Schickendantz says. If you experience shoulder pain at night that makes it difficult to fall asleep or awakens you, you may have a tear in one or more of the rotator cuff tendons. “Night pain is the hallmark of a rotator cuff injury,” Dr. Schickendantz says. You also may have this type of injury if you feel pain when lifting your arm overhead and weakness in the shoulder when trying to lift anything above shoulder level. A rotator cuff tendon can tear from a single event, like falling down on an outstretched arm. It also can happen from a motion that is repeated over time. For example, a plumber who frequently uses his or her arms overhead can develop a rotator cuff tear. The rotator cuff also can weaken with age. Treatment is rest, avoiding aggravating activities, physical therapy, applying ice, and NSAIDs. Some people with more severe pain may be helped with a corticosteroid injection, which is a powerful anti-inflammatory medication. “I usually reserve the use of corticosteroids for someone who has severe night pain and is not responding well to oral medications,” Dr. Schickendantz says. Surgery to repair the rotator cuff tendon is an option if these measures don’t give relief. Osteroarthritis happens when cartilage, which is the cushioning material that covers the ends of your bones, deteriorates, which leads to pain and stiffness. Osteoarthritis causes a deep ache in the back of the shoulder. As osteoarthritis worsens, stiffness in the shoulder develops. People with osteoarthritis typically lose the ability reach behind their back. “Patients often say they are unable to scratch their back or thread a belt,” Dr. Schickendantz says. Osteoarthritis symptoms develop over time. For some people, an old shoulder injury from sports or some other activity, may kick off the degenerative process that years later results in osteoarthritis. But many people have no specific cause — it’s just wear and tear over time. Treatment for asteoarthritis of the shoulder is similar to treatment for a rotator cuff tear, involving physical therapy, NSAIDs and ice. If the condition is severe, you can undergo shoulder joint replacement surgery, which is similar to joint replacement for hips and knees.